Ilan Ben Zion, a reporter at the Associated Press, is a former news editor at The Times of Israel. He holds a Masters degree in Diplomacy from Tel Aviv University and an Honors Bachelors degree from the University of Toronto in Near and Middle Eastern Civilizations, Jewish Studies, and English. 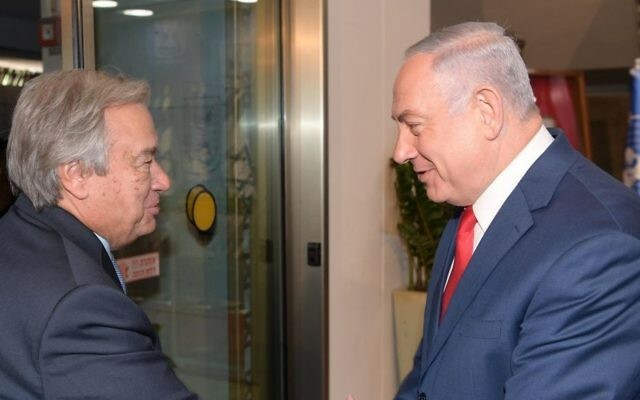 AP — Israeli Prime Minister Benjamin Netanyahu greeted visiting UN Secretary-General Antonio Guterres on Monday with blistering criticism of the international body’s treatment of Israel and accused it of failing to prevent arms from being smuggled to Lebanon’s Shiite Hezbollah terror group. Netanyahu also claimed that Iran is building sites in Syria and Lebanon for the manufacture of “precision-guided missiles,” with the aim of deploying them against Israel. Both Hezbollah fighters and Iran have backed President Bashar Assad’s government forces in the civil war that has ravaged Syria. The Israeli leader offered no specifics to support his allegations. Guterres arrived on Sunday for a three-day visit to the region, his first since taking office at the beginning of the year. His meetings with Israeli and Palestinian leaders are aimed at encouraging the resumption of peace talks. Speaking at a joint press conference with the UN chief, Netanyahu criticized the United Nations, saying that it fails to check Palestinian hate speech, “absurdly denies” Jewish connections to Jerusalem and has not stopped arms from reaching Hezbollah in Lebanon. He was referring to a recent UN cultural agency resolution about Jerusalem that angered Israel, which said it diminishes Jewish ties to the city. Israel also criticized the UN peacekeeping force in Lebanon, or UNIFIL, for being, according to Israel, soft on Iranian-backed Hezbollah forces in the border area. Guterres vowed that he will “do everything in my capacity” to ensure UNIFIL fulfills its obligations. The UN peacekeeping force’s mandate is up for renewal at the end of the month and Israel is pressing for the force to have an increased presence to better monitor and prevent what Israel says is Hezbollah building up its weapons. “I understand the security concerns of Israel and I repeat that the idea or the intention or the will to destroy the state of Israel is something totally unacceptable from my perspective,” the UN chief said. 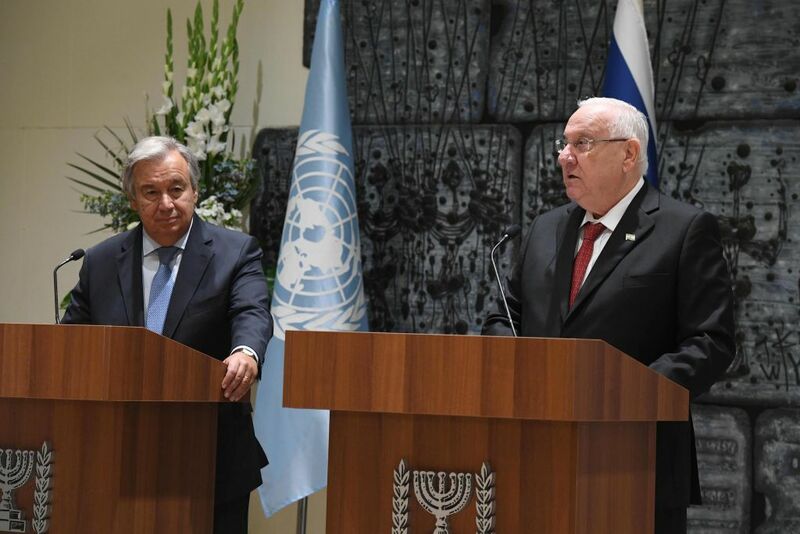 Earlier, President Reuven Rivlin called on Guterres to curb what he described as “the discrimination against Israel” in some UN institutions. 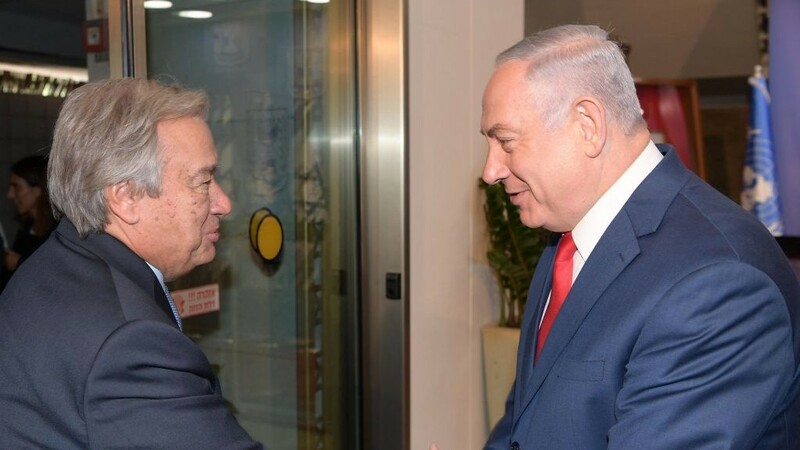 Guterres, in turn, stressed his commitment to impartiality in “treating all states equally.” He said those who call for Israel’s destruction peddle in a “form of modern anti-Semitism” — though he also said he doesn’t always agree with the country’s policies. During a visit to the Holocaust memorial before meeting Israeli leaders, he warned that anti-Semitism remains “alive and well” in today’s world and vowed to combat all forms of racism and bigotry. Guterres will meet Palestinian Authority Prime Minister Rami Hamdallah on Tuesday in the West Bank. He is scheduled to visit Gaza on Wednesday.